There's more to a good mobile than just a pretty fascia, as Sony Ericsson well knows. While Sony Ericsson has made a mint out of it Walkman phone re-invention and boosted its profile by introducing Sony Cyber-shot technology into its top cameraphones, its fashion phone offerings have been relatively low-key. The S500i sliderphone, though, shows that Sony Ericsson too can make something a bit flashy. Literally. The S500i grabs attention with a series of pulsing light effects down its side, and handsome contrasting colour combinations. The lighting effects are in tune with the S500i's "inspired by nature" themes; more northern lights than northern nightclub - subtle and gentle rather than eye-searingly brash. This particular sliderphone is aimed at the style-conscious buyer who's not looking at the big-budget end of the market. The S500i doesn't have the latest 3G technology on board (it's a quad-band EDGE handset), nor any smartphone pretensions. It does, though, have a decent set of mid-range features, including a 2-megapixel camera, digital music player with swappable Memory Stick Micro M2 card support, and full web browser and support for RSS feeds. The Sony Ericsson S500i is another slimline sliderphone, similar in body shape to the W580i and its more upmarket W910i Walkman stablemate. It has tactile rubber-textured back panel, and a glossy front panel with a fair sized screen (a 262K-colour 240x320 pixels display). It comes in a variety of colours, the "mysterious green" version we looked at being a predominantly black model with a touch of silver trim. Slip open the slider, though and the green is seen - the whole keyboard is a metallic green, and round the back the camera is revealed with a green panelling surrounding it. An unusual colour combination for a phone, but it is elegant. Other colours include "Ice Purple", "Spring Yellow" and "Contrasted Copper." The keypad itself is laid out for sensible sized finger-tapping with big enough keys laid out in a straightforward four-row grid. Opening the display also debuts the lighting effects, with the sides of the phone glowing from translucent panels inside. The navigation pad surround also lights up. The smooth slider feels solid enough, although there is a bit of plastic squeakyness when pushing on the front panel. The lighting effects can be set up in the phone's menu system to glow and pulse in a variety of colour combinations to suit your tastes. Even the more glam sounding "love", "fire" or "disco" aren't shockers, though - it's all quite subtle. The lighting effects are carried over to the "Everchanging" default theme, which has a forest look and feel that changes gradually over time, from day to night and across days and months. The navigation system on the S500i is typical Sony Ericsson; a central navigation pad and combination of softkeys and back buttons take care of the main routing, while additional fastkeys can slip you quickly into your most used functions. The main navigation menu is an icon-based grid, although this can be converted to a carousel by tweaking the onboard themes. One nice touch is vibrating feedback when moving between main menu options. The extensive sub-menus are standard list based options, with tabbing to help you select categories. In practice, the navigation pad can be somewhat awkward to use for the large-fingered, as the directional options are operated by pressing on the internal ring surrounding the central select button. Incidentally, the four-way navigation button can also be user-configured for fast access to three functions, with the "up" option pre-defined as a fastkey for the phone's camera. The camera on the S500i is a fairly standard 2-megapixel model - Sony Ericsson doesn't yet spread its Cyber-shot largesse to all its cameraphones. There's no flash on this model, and it lacks autofocus and macro modes that can enhance shooting close up. And the 2.5x zoom only works on the lowest quality VGA setting. The fixed focus camera has a few basic control adjustments - including white balance and night mode - plus features such as panorama shooting and various effects. It is limited though. Shots can produce decent printable quality shots in good lighting conditions, but indoors shooting and close-ups aren't great. The photographic experience isn't helped by the cramped use of only part of the display for framing shots. On the plus side though, Sony Ericsson has once again included the option of uploading images directly to a Blogger blog, adding a bit of text too. It's really simple to use and can automatically set up an online Blogger account from the phone. Video recording is another feature available to camera users, although quality at maximum 176x144 pixels resolution isn't great. The onboard music player fares better. It doesn't have all the delights of the latest Walkman music player user interface, but it is none the less produces a very listenable musical experience. The built in speaker can really crank up the volume, although it is trebly. The stereo handsfree earphone kit supplied with the S500i isn't up to the standard of Walkman phone earbuds, but still puts in a respectable performance. There's no 3.5mm adapter for standard headphones to boost the quality - the S500 uses a proprietary connection - but you could always opt for stereo Bluetooth wireless headphones. Adding tracks to the phone is easy too. You can use the supplied USB cable to sync with Sony Ericsson's Disc2Phone PC software, or simply drag and drop music files to the phone. You could also Bluetooth tracks over from someone else. It would be wise to invest in a high-capacity M2 card, though, as the onboard memory is a mere 12MB. The S500i supports M2 cards up to 2GB. Unfortunately, there's no FM radio on this model and Sony Ericsson's impressive TrackID name-that-tune software is absent too. The phone does offer a selection of Sony Ericsson software for ringtone composing (MusicDJ), image tweaking (PhotoDJ) and basic video editing (VideoDJ). A lack of 3G notwithstanding, the S500i has a handy full internet browser. The Access NetFront browser can render regular websites in mobile screen-friendly scroll-down form, or a as full pages. You can also set up the phone to read RSS feeds, a handy way of getting info updates without trawling through websites on your phone. The S500i has an email client, so you can check your POP3 email accounts. There's also organiser functions such as calendar, tasks, notes, timer, stopwatch and calculator, plus a code memo reminder. A voice recorder option is also to hand. PC suite synchronisation software is supplied with the S500i, so you can back up contacts, appointments, tasks and notes using the USB connection or via Bluetooth. If you're looking for more to keep you amused, the S500i comes with a couple of Java games preloaded, Brain Juice and Lumines Block Challenge, and more can be downloaded; Sony Ericsson has built in links throughout the menus to get additional content straight from its download site. Extra Java applications onboard include an audiobook player, AudiblePlayer, and a weather update service, AccuWeather Light. With all lights blazing, you might expect a strain on battery life. The S500i, however, has commendable staying power. Sony Ericsson claims standby capacity of up to 9 hours' talktime or 370 hours on standby before refuelling. While we didn't rack up these figures in normal usage - particular as music playing is draining - we were able to relax about recharging for 4 or 5 days. The phones audio performance for calls proved first class, and we had no complaints at either end of calls. 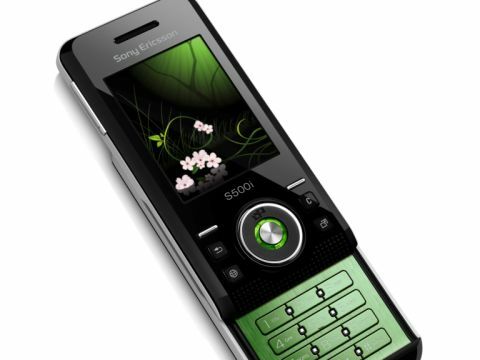 The Sony Ericsson S500i is a tidy handset that's clearly pitched at the style-conscious young mobile user. So it's not got the cutting edge features of more high-profile (and more expensive models). It is a touch different with its Nordic-lighting inspired light show, novel colours and themes, which will appeal to some of its target audience. Sony Ericsson undoubtedly produces better specialist Walkman and Cyber-shot handsets, but as an all-round mobile at an affordable price with a bit of a twist, we can see this having some appeal, particularly as a pre-pay buy.